For the first time in five years, McDonald’s has introduced a new breakfast sandwich. 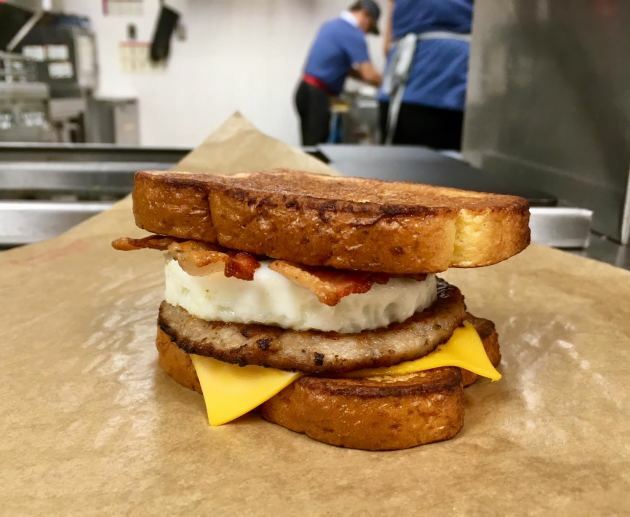 This week, more than 200 of the chain’s restaurants in the Twin Cities, Duluth, Mankato and Rochester have started test-driving an a.m. delicacy called the McGriddles French Toast sandwich. The sandwiches debuted on Monday, the culmination of a two-year-old effort that started when Golden Arches market research indicated a (sorry about this) hunger for a more substantial breakfast sandwich. Kitchen brainstorming was followed by focus group testing, concentrating on items incorporating French toast, a staple missing from the chain’s hotcakes- and Egg McMuffin-centric breakfast routine. Interestingly, one of the chief takeaways from the consumer input was simplicity. That’s what they got. The sandwich begins with two slices of brioche (“If I were making French toast at home, that’s what I’d use,” said Lingo) that are enriched with eggs and hints of vanilla and cinnamon. The slices are warmed, brushed with a pancake syrup and layered with American cheese (standard-issue McDonald’s cheeseburger cheese), pork sausage (the same patty used in the Sausage McMuffin), an egg cooked in a round mold (the shape mirrors the outline of the Egg McMuffin’s English muffins) and applewood-smoked bacon. “Then we fold the paper around it, tuck it under, tuck it under, and breakfast is served,” said Lingo. Not bad. Not bad at all. It certainly nails the “filling” goal. Texture-wise, it’s got crunch (that thinly sliced, nicely crispy bacon) and chew (the sausage), and the bread captures some of that pillowy texture that makes French toast so French toast-ey, without being greasy. Pure maple syrup would be a vast improvement over that too-sugary, too fake-tasting pancake syrup, but, let’s get real, this is McDonald’s. And while a runny egg yolk would be ideal, that’s all but impossible in the pressure cooker that is a McDonald’s kitchen; it would probably also lead to ruinous dry cleaning bills for those doing the drive-through dine-and-dash. Lingo stresses that this is a prepared-on-the-premises item. Bacon, sausage and eggs are cooked on site, a practice followed since the advent of the Egg McMuffin in 1972. Several Minnesota companies are involved in the rollout. St. Paul-based Baldinger Bakery — which has been baking for McDonald’s since 1957 — is responsible for the bread, although the actual production takes place in one of the company’s Canadian facilities. A Cargill plant in Monticello handles the manufacturing process that creates the bread's eggy coating. The price varies among franchisees, but hovers around $4.39. Unlike the rest of McDonald’s breakfast-all-day menu, the McGriddles French Toast sandwich is available up to 10:30 a.m. “A select number of locations are testing all-day availability,” said McDonald’s spokesperson Anne Christensen. Lingo, an Iowa native who works in the company’s suburban Chicago test kitchens, has helped create so many new products for McDonald’s that he says that he’s lost count of the number. His first challenge was removing artificial colors and flavors from Chicken McNuggets, and a recent favorite was the development of the Bacon Smokehouse Burger. “Get it as a double,” he recommends. If the McGriddles French Toast sandwich proves to be a hit, McDonald’s will roll it out in the second quarter of 2019.